This means when a woman is exposed to certain environmental toxins, there may be an increased likelihood that her future baby boy may be diagnosed with testicular cancer later in life. This is a crucial reason why it is vitally important for women to start making safer choices now by using everyday products without harmful chemicals. The average age range of men diagnosed with testicular cancer is 15 to 35. As college-aged men are more likely than older men to be affected, it is particularly important they learn to “check down to see what’s up” for early detection. In order to spread these important messages, Protect Our Breasts is re-launching our campaign, “Protect Our Boys” during the month of November. Empower female students to make safer choices now in order to protect the next generation. 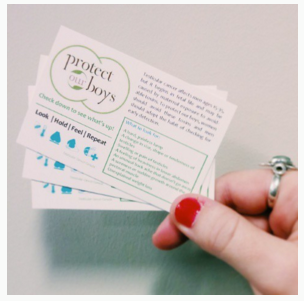 Help spread our message by “liking” and “sharing” each Protect Our Boys’ post on Facebook, Twitter, and Instagram!